Summer is a wonderful time of year for a multitude of reasons. You get to enjoy warm weather, backyard BBQs with your loved ones, vacations on the beach, an excuse to eat ice cream every day — the list goes on. As joyous as this season of sun can be, like anything, it has its downsides too. On top of mosquitoes and excessive sweating, there are some plumbing issues that you may be facing this June, July, or August. Fortunately, you can rely on Hubbard Plumbing to provide the relief you need from pesky plumbing problems. In the meantime, here are some of the problems you may face this summer with your plumbing. One of the struggles of summer is keeping your lawn looking green and lush. On long, hot, New York days, it’s easy for your grass to look quite thirsty. Therefore, you want your sprinklers to be in proper working order. Unfortunately, automatic sprinkler systems receive a lot of wear and tear, and the sprinkler heads tend to break down as time passes—especially when the lawn company runs over them. At the beginning of summer, make sure to check that all of your sprinkler heads are in working order. Any old heads should be replaced. You can usually find replacements by taking the old head into the hardware store and finding an exact match. One of the joys of summer is that the kids are home, but with that comes its own difficulties. With more people using the bathroom on a daily basis, your toilet is working overtime, and children often don’t understand how to be gentle with a plumbing system. Make sure to teach any youngsters about using only a few pieces of toilet paper, and that they know that toilet paper is the only thing that goes down the toilet. Of course, all these precautions will not necessarily stop your toilet from becoming clogged. Make sure to keep a plunger on hand for these situations, and teach your children how to use it. If a plunger fails to fix the problem, you might need a professional to come in, and we would be happy to help with that! With summer comes heavy summer storms, and while these can provide some much-needed relief from the heat, they can also cause some issues with your sewer lines. This is because the rain can flood the ground, causing the sewers to become backed up. In turn, this can cause cracks in your pipes/ The best thing to do is to work to prevent the issue by installing drain plugs before the summer storm season hits. This is a great option for homeowners who are concerned with the sewer line backing up. Worst case scenario, if your pipes do become cracked and you begin seeing backup in your bath or toilet, we can help. Contact us for a skilled plumber to come to your home and address this issue. In our next blog, we will continue to go over common plumbing issues. 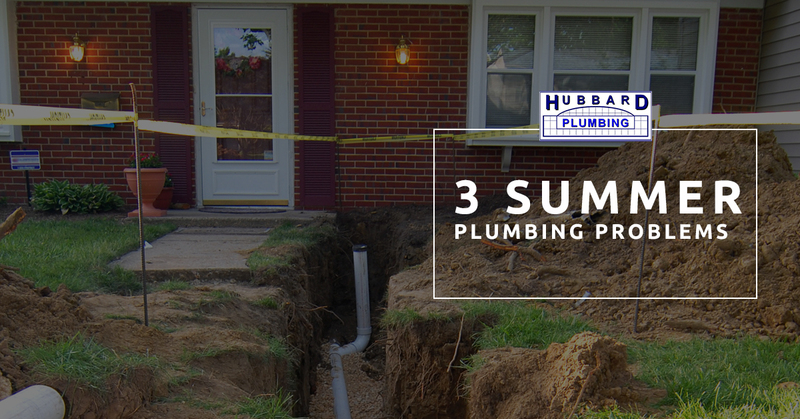 At Hubbard Plumbing, we appreciate being the plumber you have on speed dial in Suffolk County. If you need help navigating any of your summer plumbing problems, we are qualified, professional, and prompt with our services. Contact us today to schedule an appointment!